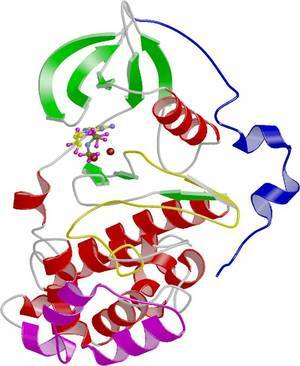 Protein kinase CK2 is a heterotetrameric enzyme composed of two catalytic subunits (CK2α) and two non-catalytic subunits (CK2β). While CK2β has no relatives under the currently characterized proteins, CK2α belongs to the extended superfamily of eukaryotic protein kinases (EPK) which comprises about 500 members in Homo sapiens. More precisely, CK2α is a member of the CMGC-family of EPK enzymes, i.e. its nearest relatives are such promiment enzymes like the cyclin dependent kinases (CDKs), the mitogen-activated protein kinases (MAPK) or glycogen synthase kinase 3 (GSK3). Currently, in the context of a DFG-funded project (grant NI 643/4-2) we explore the structure/function relationships of CK2 and develop in cooperation with Dr. Markus Pietsch (University Hospital Cologne, Centre of Pharmacology) small molecules that interfere with the CK2α/CK2β interaction.